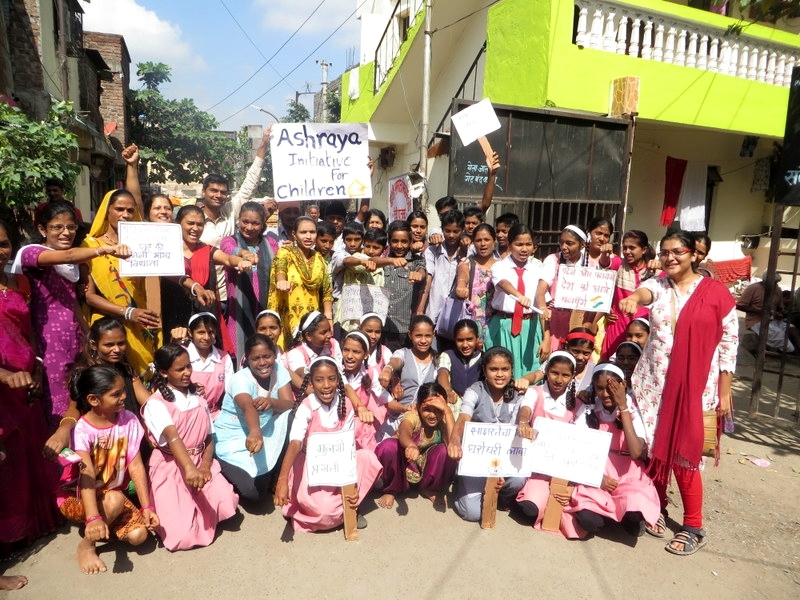 As the underlying themes that underpin our work are the education, cultivation, and empowerment of the next generation of Waghri and Sikligar community members, this occasion is quite significant for us here at AIC. It celebrates the importance of one of the main efforts we undertake in our Education Program – to provide our children with the literacy skills they will need in order to break the cycles of poverty and marginalization that circumscribe their families’ lives, and to lead their communities by being the first educated members of their families. In true AIC fashion, we decided to celebrate International Literacy Day with gusto, and our on-site celebration morphed into International Literacy Week! As such, we orchestrated activities, general knowledge quizzes, and discussions for all of our classes as well as for parents and our beloved maushis (caregiving staff) over the course of the week leading up to International Literacy Day on September 8th. 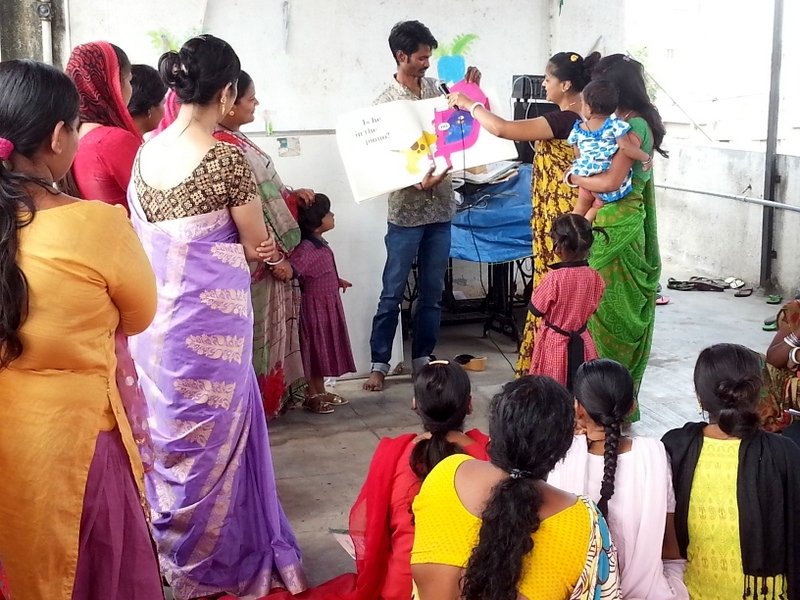 For our youngest students (playgroup and pre-primary), we decided to put on a series of activities to engage parents in the learning process and strengthen parent-child bonding through literacy games. These involved activities ranging from a letter matching game, rhymes, a discussion about assessment and achievement at AIC, and a storytelling activity wherein groups of parents and students worked together to retell and act out (with as much dramatic flair as possible!) stories in front of the entire group. Though many parents were initially shy, it ended up being a wonderful activity in which parents and children showed off their brainstorming and presentation skills, teamwork, creativity, and acting abilities. 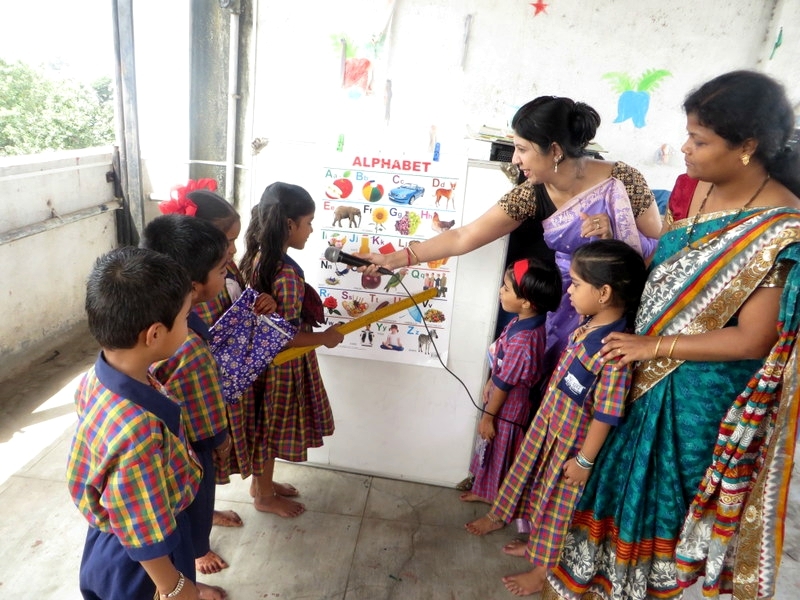 In a separate event, first and second standard children learned about the importance of education both in the short term and the long term. The children learned the meaning of the word “literacy” and had an interactive discussion about the value of being able to read and write. We also thought a hands-on activity would be great to better the kids’ understanding of the topic, so we arranged a put 25 objects in a box (for example a doll, an eraser and pictures of animals). Students identified each object based on clues from the teacher and examined at how it was written out on the board, lending a more practical approach to improving their literacy skills. They also watched a short film about a little boy’s quest to learn to read and write. Older students brought their parents for a special activity too. The parents wrote their full names out in English and Hindi, and answered basic questions in full English sentences, having been carefully prepped by their children at home ahead of time! 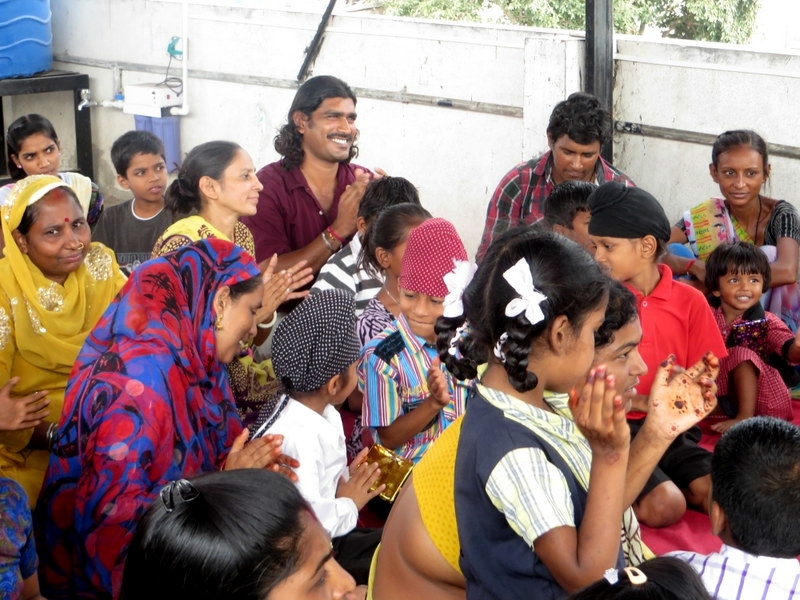 The expressions and emotions displayed by the parents as they had fun trying to write and speak basic English, and work with their children to figure out some brainteasers and word games were truly heartwarming. Other classes enjoyed drawing and writing exercises with their parents, wherein students had the opportunity to show off their academic progress and growth to their parent as they taught their parents to write their names and worked together to create artwork depicting their families and homes. 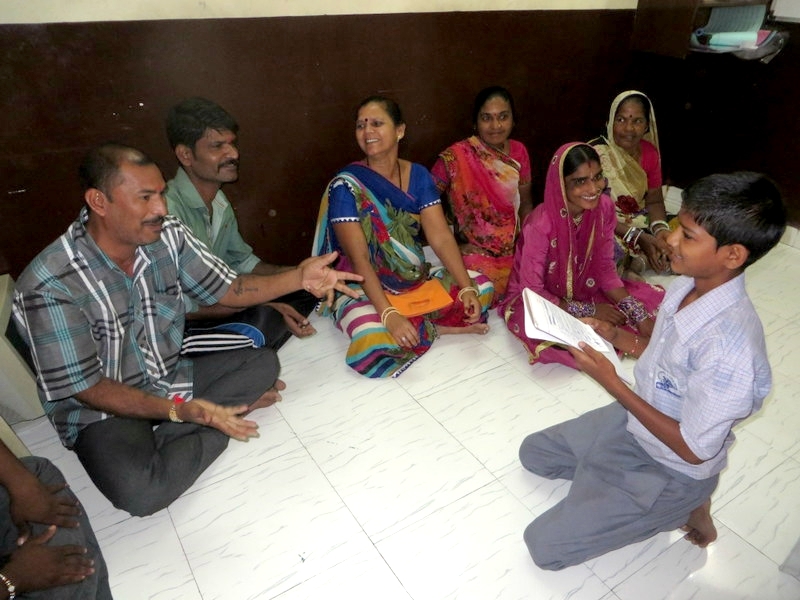 Our Marathi-medium secondary school students practiced their interview skills in a group session by interviewing their parents about their views on education and literacy, as well as their persuasive argument skills when they made a case for the importance of literacy. They were even successful in convincing some of their parents to commit to furthering their own literacy goals – talk about persuasive! We also carried out a general knowledge quiz for parent-child teams, after which we reinforced the point that learning should be a holistic experience that rounds an individual and helps them grow as a person; it should not simply be an exercise in passing exams and obtaining qualifications. We encouraged the parents to be open-minded about their children’s education, and felt they were quite receptive to our message, awed by education’s potential of empowerment that the activities had shown them and stunned by the progress their kids were making in their studies. Parents and children loved the quiz competition, which became very animated as the competition became fierce and parents and children consulted each other and jostled to give answers. Caregiving staff who attended with their children had a particular advantage during the “AIC Trivia” round! Over the weekend, our students and teachers held a rally in the neighborhood and around their home communities. 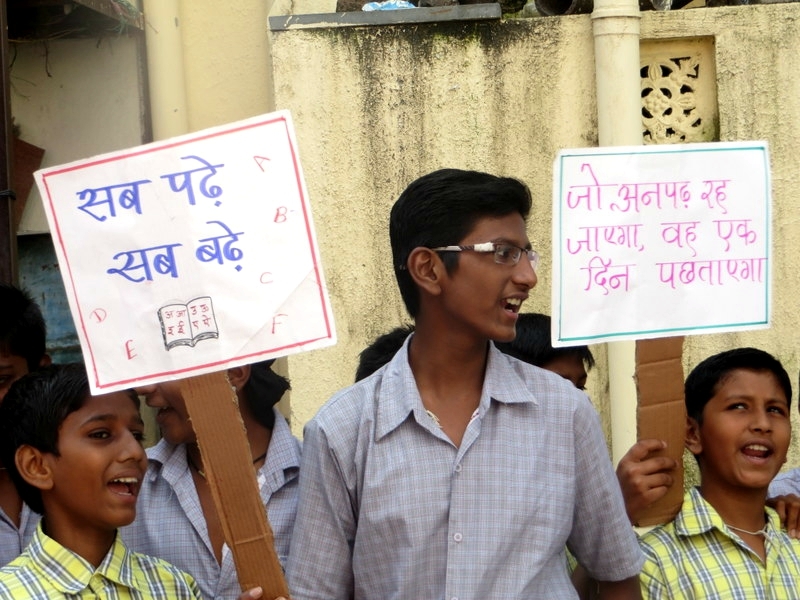 What a proud moment to see the AIC girls and boys bravely standing up for their right to be educated! 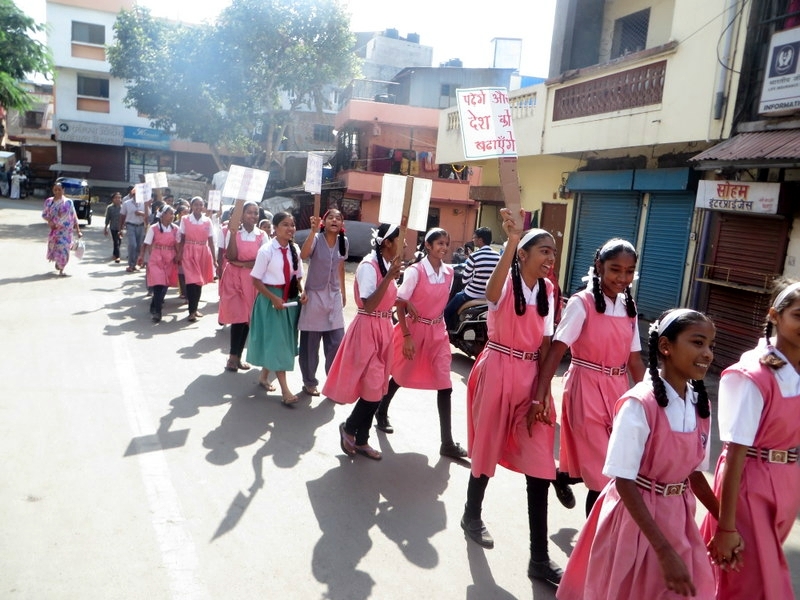 Neighbors and community members were quite curious about the well-organized parade of children carrying signs and shouting pro-literacy slogans past their doorways, and stopped what they were doing to come out, ask questions, and watch the small street play put on by some of our 10th standard students.The most inspiring part of all was seeing several of our older girls who were forced to drop out of school or were married as young teenagers but who have since rejoined our Education Program, marching confidently through their slums and demanding the right to finish their studies. Additionally, we inaugurated classes for our caregiving (maushi) staff last week. 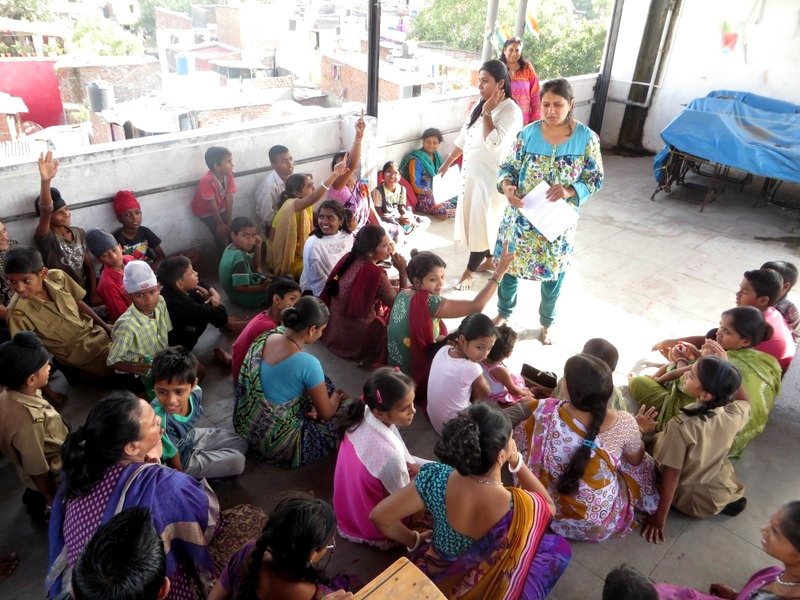 We had been thinking of starting literacy classes for the hard-working community women who treat the AIC children and Centre like their second home for a while now, and International Literacy Day seemed like the perfect occasion to kick off these classes! Proving that literacy is a life skill that can be learned and developed at any time, our caregivers spent their first class attentively reviewing the Marathi alphabet. 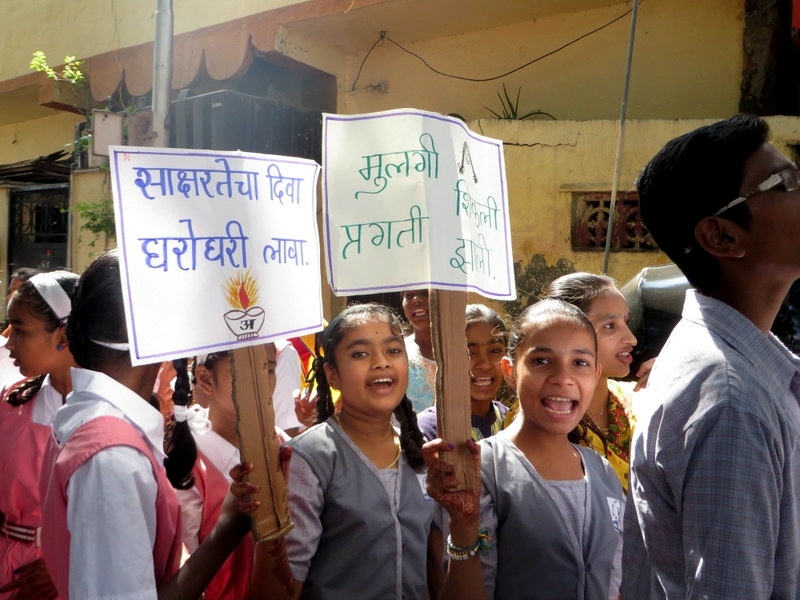 It was humbling to see how eagerly they wanted to learn, and they also pointed out that in addition to Marathi, knowing English in today’s international and interconnected world has become imperative to success. The caregiving staff has requested additional practice with spoken English alongside their written Marathi classes – that’s serious motivation right there! Last but not least, in preparation for the festivities, we surveyed 60 of the Education Program children in grades nursery through Standard 3 about whether they have books in their homes (and if so, how many). Sadly, but not surprisingly, out of 60 children polled, only 4 owned a single storybook; the remaining 56 children reported having not a single book in their homes. You can imagine what this means for their literacy development at what is such a crucial stage for these milestones (ages 3 – 9). This new information reinforces our understanding of how important the children’s hands-on access to high-quality literacy resources is during their time at the AIC Education Centre every day. 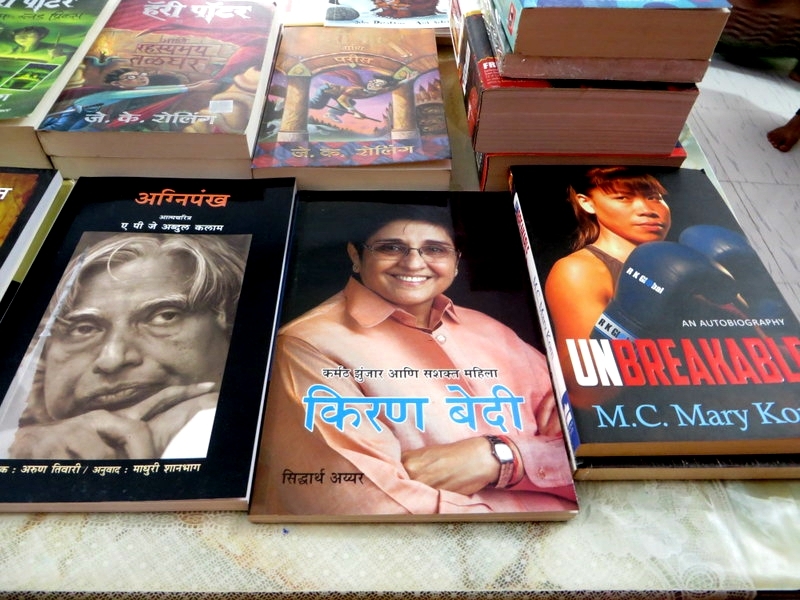 It also renews our desire to establish a lending library and to gift books to the children at every possible opportunity (good attendance prizes, Diwali gifts, etc). 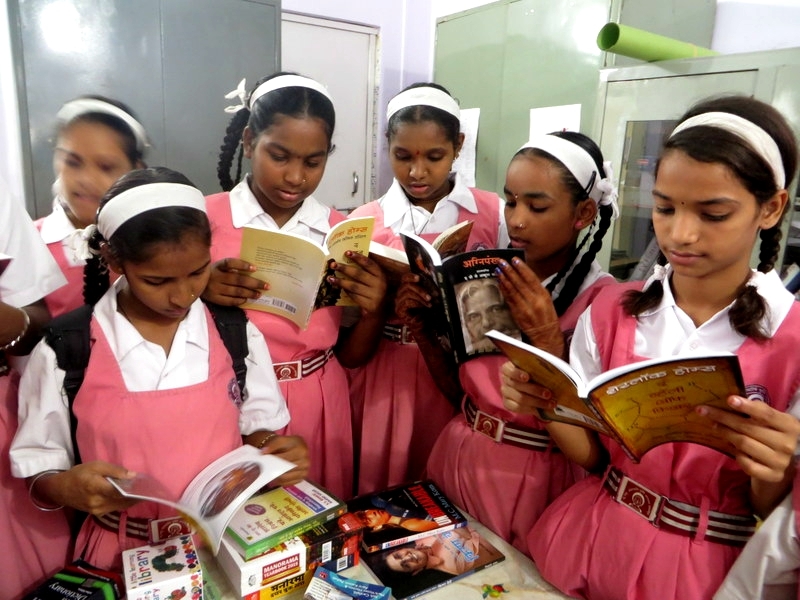 Our goal is to ensure that by the end of the school year, 100% of our children will be able to proudly proclaim that they have at least a book or two to call their own, as well as access to a supply of continuously updated books and reading resources through a small lending project. To kick off this goal and in honor of International Literacy Day this year, we published a books wishlist on Amazon.in and were blown away by the response from our supporters. So far nearly 200 books have been purchased off our wishlist (we’ve had to continue adding new titles to keep up with the response!) and every evening our Education Program Director returns home from work to a lovely pile of packages at her door. Overall, it’s safe to say that International Literacy Day (or in our case, Week) 2015 was a tremendous success! The community response humbled and inspired us, and the energy and encouragement generated by our staff, supporters, and partners near and wide in celebration of this event has been absolutely exhilarating. The ability to read and write is a beautiful, powerful, worldview-expanding skill. Reminding ourselves that, step by step, slowly but surely, we are working to empower the next generation, allowing them to achieve the education and employment that will pull their communities out of vicious cycles of poverty and marginalization, makes our daily work feel all the more worthwhile.